What attracts students and parents to a school? 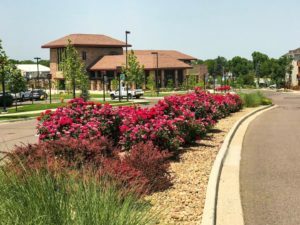 One major factor that might go overlooked is the curb appeal of the campus environment. A well-maintained landscape will draw them in and add a level of pride and beauty, which will contribute to their decision. Below are three recommendations to add value to your school or campus and increase enrollment. 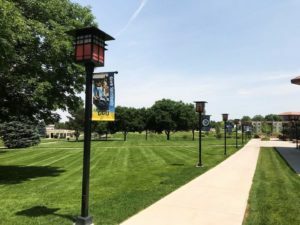 One of the first things a potential student or parent sees when they are making that initial drive to explore the school or campus are the medians leading into the parking lot of the school. The school sign and the median landscaping surrounding it are the first impression of the educational institution. This makes entryways and medians that much more important. Many families capture visual images to help remember the campus and it’s important that yours stands out. We recommend having beautiful, eye-catching flowers and plants that guide visitors as they make their way to their parking spot. Having well maintained green spaces are vital when it comes to schools. No matter what age the students are, they all appreciate having open spaces. These spaces provide opportunities for relaxation, physical fitness and a place to connect with others. In addition to that, green spaces provide vegetation that help with carbon levels ensuring that the students are breathing cleaner air. Another perk of green spaces is noise reduction, helping students with their ability to study.